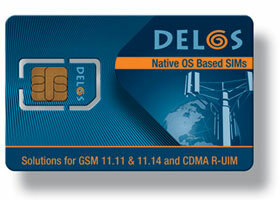 Delos® cards are a microprocessor based smart card family designed for cost effective SIM provisioning of GSM and CDMA handsets. The Delos family of cards can get your project to market quickly. Many of these cards are based on flash technology which allows for a rapid development and test cycle. This is accelerated by a quality data provisioning development environment from Bantry Technologies/Trusted Logic, dubbed Geode. CardLogix can also help you with a range of collateral and fulfillment options. Delos cards fully support the ISO 11.11 and 11.14 SIM toolkit and Phase 2 standards as well as offering a S@T or WIB browser. The family further supports many variants such as cards for the Asian PIM requirements, compliant with the PHS standard, as well as R-USIM cards for CDMA systems. For a comparison of features please review our Smart Card Product Selection Guide. Cards are available with custom printing in the SIM, CR-80, and key fob form factors. Additional features can include high industrial reliability for M2M chips and high temperature card substrates, laser engraving, and dye-sub printing of SKUs, ICCIDs, and barcodes.